Time for another entry to the hall of shame I’m afraid, and this time it’s BT who are at fault (I realise that’s a terrible pun). In my previous example of a Halifax letter about online banking, they were trying to pass on some functional information, and the change it was describing was going to happen, regardless of my understanding of the letter. In situations like this, the communication is more of a courtesy – albeit an unnecessarily long one. There are a number of fairly obvious mistakes (well, they are to me) that lead to this confusion. Maybe it’s my cynical nature, but one thing that always catches my eye are statements such as ‘up to’ and ‘more than’. These immediately make me think that things aren’t as simple as they seem – and usually they aren’t. In this particular example, these ambiguous statements aren’t helped by the use of percentages. Maybe it’s personal preference, but I’d rather see a fixed amount used. 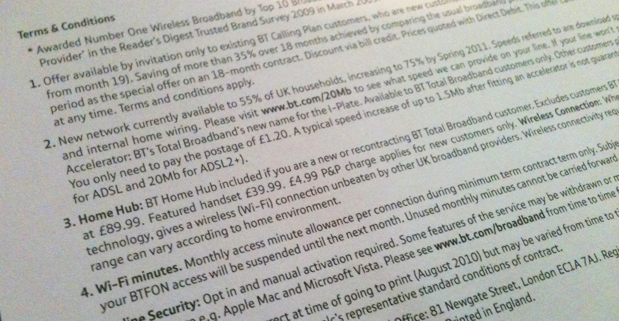 How about ‘Save £5 per month on our top broadband package’? As I explain in my post about making sure white space isn’t wasted space, keeping these kind of cross references to a minimum (if they really have to exist) is an important part of keeping a reader’s attention. 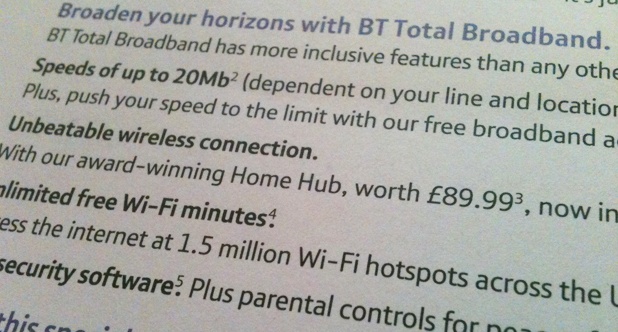 In the example below, if BT want the reader to fully understand the offer, they are asking them to leave the text (which explains the features of their broadband) five times. There is also no clear mention of where the notes are that go with this text – on the back as it happens. Any chance of me even thinking about taking up this offer was removed when I turned to study the notes. I haven’t done an exact count, but I’m confident there are more words in these terms and conditions on the back of the letter, than there are on the front. Faced with this amount of text, at a very small size, almost anyone is likely to be put off reading any more. Exactly what is contained in this text I don’t really know, and thats the main point of the problem with this letter. What is probably a perfectly good offer is lost in an over-abundance of information. And as with most cases, a lot of it probably doesn’t need to be there.